Apoptosis. 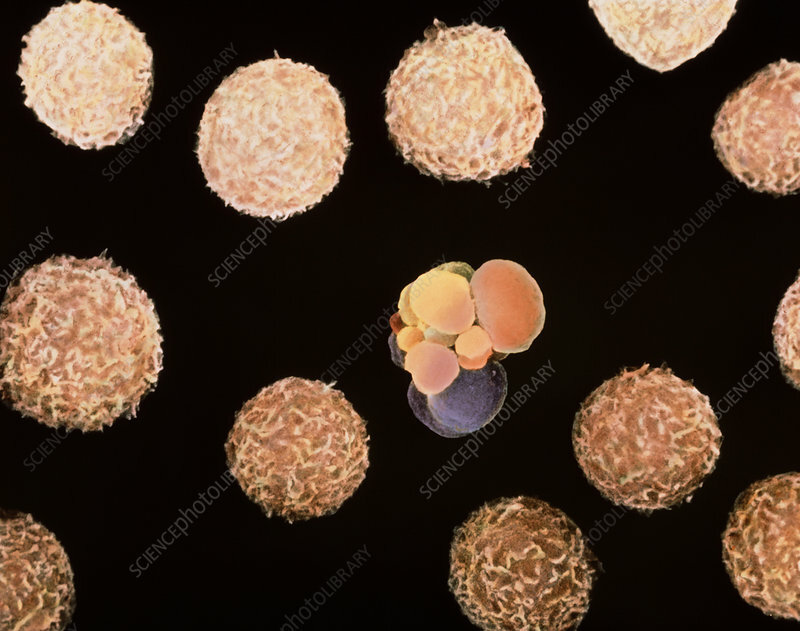 Colour scanning electron micrograph of human white blood cells (leucocytes), showing one cell undergoing apoptosis. Apoptosis is the process of "genetically programmed cell death". At centre, an apoptotic white blood cell has shrunk and its cytoplasm has developed blebs (grape-like clusters). Normal white blood cells are seen beside it. These white blood cells are myeloid leucocytes, originating from bone marrow. The human myeloid cell line depends on growth factors to survive, and cells undergo apoptosis when deprived of growth factors. Research on apoptosis may provide genetic treatments for diseases such as cancer. Magnification: x1,500 at 6x7cm size.